Remember the summer of dangerous dogs? When every second story was a dog biting someone? Or when every field had a crop circle? This year it would seem it's the turn of seagulls. Yorkshire terrier killed by seagulls in Cornwall. A world leading pianist was dive bombed by gulls as he was leaving a rehearsal in Liverpool and injured his finger resulting in him having to pull out of a series of concerts. Back in Cornwall gulls have killed a pet tortoise. Why have seagulls suddenly become so vicious? Or perhaps the question should be why have they lost their fear of people? Too some they are a pest and a nuisance and to others a beautiful bird exceptionally well suited to its habitat. And there-in lies the paradox. Although herring gulls (the species most Brits think of when gulls are mentioned) are quite common in the UK (RSPB estimates 140,000 breeding pairs) they are actually red listed world wide meaning it is globally threatened (although IUCN has it at the 'least concern' level for red listed species) and has suffered significant population and range decreases in the last 50 years. The other regularly seen species are amber listed. So whilst there are certain local areas with real problems leading to lurid headlines conservationists need to consider the global scale as well. 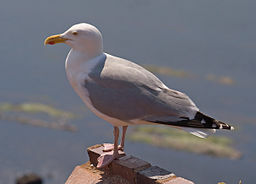 Find out more about Herring gull status with JNCC here. And that's where the PR team come in, educating people on how to deal with gulls - don't feed them, keep rubbish covered, if you're in a danger area (near nests) protect yourself against dive bombing (umbrellas work well). Whitby is of course a seaside town, still a fishing port (just), meaning we have plenty of experience of life with gulls. Many of the older properties (and some newer ones too) have fluted, fancy raised roof ridges - not just because it looks pretty but the gulls can't stand on them! Until recently flat roofs were a rare sight. Gulls have been culled in the past, eggs oiled etc. and it's an ongoing question in the local paper as to how to deal with them. But the headline in Friday's edition really takes the biscuit! You didn't tell us about the seagulls. A guest staying at a harbourside pub & b&b left in the middle of the night because the owners didn't warn them about the possibility of squawking birds.